So I was scavenging old electronics for parts when I come across an old handheld game. I put batteries in it and turn it on, and it works great. It even has sound. I took it apart to get the battery cage, but then had an idea. 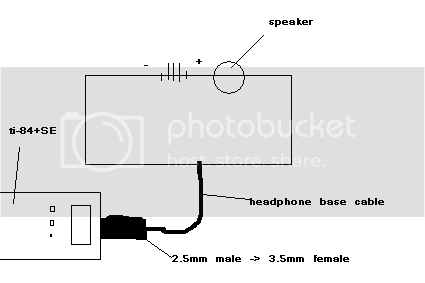 Could I use the speaker in my TICI hub? Would calc sound programs work with it? btw, I don't have a digital camera so I just used my scanner (like I did for my avatar). Also, if this does work, would 4 AAA batteries be good to power the hub? might work. Only ASM really does sound though. How much power does the hub require? Kerm's schematics(sp?) on ticalc.org say 3AAA batteries. it may or may not. I would lean more towards stick with the three. Okay, I'll try three first. But how does the wiring for the speaker work? 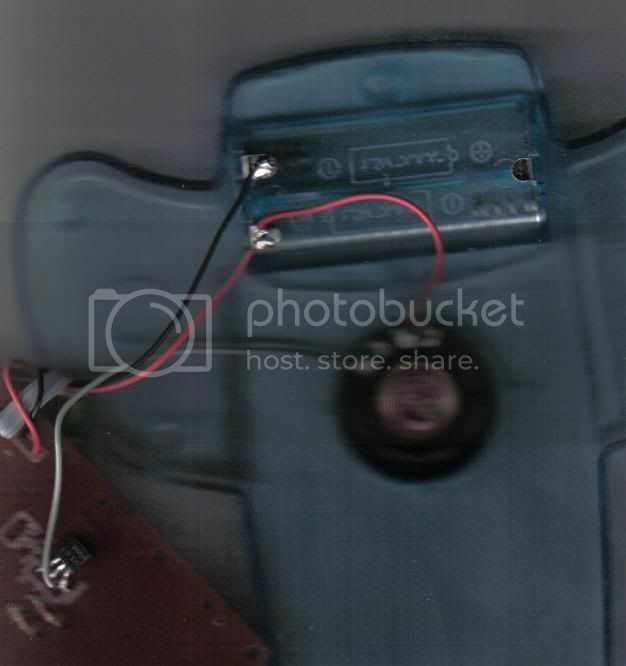 There are two wires coming from the positive end and only one from the negative. How would I wire that in my hub? What you have is a piezo then; one of them helps vibrate the piezo more effectively; there'll be two out of the three that are particularly close together; use one of them as your positive, and the other (third wire; not part of the two that are close together) as your negative. Alright. Thanks. I'll let you know what happens once I get it put together. I just left the tip and middle of the headphone cable unattached to anything. Is that where I went wrong? NO NO NO!! Don't connect that to your calc again!! You could destroy the link port. Just connect it between copper and black and see what happens. You'll need a switch to disconnect it during normal use, since leaving the low impedance connected both drains the batteries and makes the calc think you're trying to send it a silent link transfer. Okay, so I guess it wasn't a good idea... My link port still works. I scared myself, though. I tried sending a program from my sister's calc to mine and got an "Error on Xmit" error. I tried again with a real variable, though, and it worked fine. For future reference, you need at least two wires for a complete circuit. What you did there couldn't actually have damaged your linkport, since you had no wires to create a potential difference across. You should probably use a single SPST switch with two of those piezo buffers for stereo. Connect the switch between the base and the two piezos, then connect the other end of the piezos to tip and ring respectively. Or... just buy a speaker that plugs into a headphone jack? 0x5 I feel like a 12-year-old trying to shave. I have no clue what I'm doing, or why I even need to do it, but still really want to. Well, I know your schedule is always pretty full, so I understand if you can't, but I really would appreciate it if you did. And, come on, how many of you can truthfully admit that you never wanted to shave before you had to? Thanks, I'll try to get to it after work tomorrow. You should probably use a single SPST switch with two of those piezo buffers for stereo. Connect the switch between the base and the two piezos, then connect the other end of the piezos to tip and ring respectively. Unless I'm mistaken, he only mentions one speaker. No stereo or piezo buffers are needed. All he needs to do is connect one of the two positive parts of the cable to the speakers positive, and the negative to the negative on the speaker. As the linkport itself is only capable of mono sound anyway, both positive ends of the wire after the 2.5mm->3.5mm adapter will have the exact same signal going through them. Yeah, there's only one speaker. And how do I know what end it positive coming out of the adaptor. I have the tip, middle, and base. Is one of those positive and one negative? Sorry, I really don't know what I'm doing. Alright, thanks. I just wish you could test hardware with emulators. © Copyright 2000-2019 Cemetech & Christopher Mitchell :: Page Execution Time: 0.101680 seconds.